Why on earth would a woodworker talk about urethane moldings? Tom Banwell answered that for Woodezine more than a decade ago. 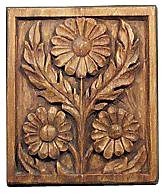 Based in Penn Valley, California, he is an acknowledged expert in making resins look like wood - such as the reproduction of a woodcarved panel below (right). According to Tom: "resin can be made to resemble wood, duplicating every chisel mark in a carving. End grain, cracks, and the open grain of oak all come out looking just like the real thing. Natural pieces of wood with or without bark, and driftwood are also easily reproduced. Wood stains, antiquing and paints can be used to enhance the look." Making plastics look like wood has been a constant theme in the moldings world for a very long time. Witness the excellent ceiling medallion above by Tom, where he applied a faux chestnut finish that blends beautifully with the real wood ceiling above it. 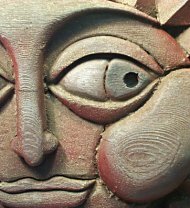 Or the detail from Tom's 'Sunface' at left, with such realistic grain. Applying a wood finish to moldings to make them match the natural elements in a project is certainly a viable option for woodworkers. But it isn't the only one. Urethane moldings, especially architectural pieces, can be used extensively in the woodshop - as accents on furniture and cabinetry, in frames and fireplace surrounds and hundreds of other applications. The finish doesn't have to be purist. It can be stained, painted or dyed to a myriad tones and still work well with natural grains. Using precast corbels or other elements can be an economical way to add fine architectural detail to a project, or duplicate missing elements. Take, for example, a couple of corbels like the one shown at left. If they were ebonized (painted almost black), or even painted to match the trim color in a room, and then used to support a thick maple shelf, the opposing textures could be quite dramatic. It's even more fun to think about using flexible moldings that can follow a curve or an arch, such as the one shown at right. Aside from the design possibilities presented by precast, extruded or flexible moldings, there are a few other reasons to consider using urethane products. For one, the cost can be quite a bit less. Uniformity is another factor - these moldings are engineered, not grown, so the intervals between the teeth in a dentil molding can all be absolutely uniform. And defects are virtually eliminated - annoyances like splitting, cracking, splinters, warping and even rotting are not issues. Plus, you don't have to sand them, which on its own is enough to make this old woodworker take a second look. One of the biggest upsides to urethane and similar moldings is the huge variety of profiles available. 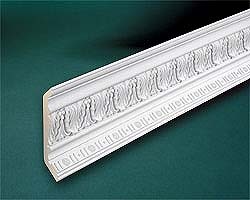 While much of each manufacturer's catalog is devoted to tried and true classical moldings based on Greek and Roman architecture, some of the more imaginative suppliers have extended their repetoire to include elements of American and modern European architecture. 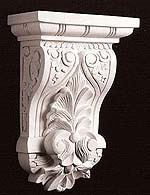 That's not new: Colonial and Federal artisans once took classical forms to a new level and produced in cast plaster what might not have worked so well in the original carved marble. Other manufacturers nurtured that evolution with wonderful moldings like the bent crown (above left) that was made by Style Solutions, which sadly is no longer in business. But a new generation of engineers has taken up the reins, and companies such as EL and EL Wood Products and Apex Urethane Millwork now embody that challenge.